Australia’s deepening mathematics deficit threatens to derail innovation and future prosperity, as the discipline feels the effects of gender inequity and an ageing workforce. The Australian Mathematical Sciences Institute’s (AMSI) warning comes as it releases its latest report on the state of the discipline. “An entrenched gender divide and a critical failure to engage younger generations continue to pose a very real threat to Australia’s innovation future,” says AMSI Director, Professor Geoff Prince. Figures in AMSI’s Discipline Profile of the Mathematical Sciences 2016 (see below) show the mathematical sciences is trailing behind other Science, Technology, Engineering and Mathematics (STEM) disciplines in its engagement of women.This gender divide is being exacerbated by the impacts of an ageing workforce. While 40 per cent of the current mathematical workforce is female, there is little scope to replenish skill supply with falling numbers of younger women entering the discipline. 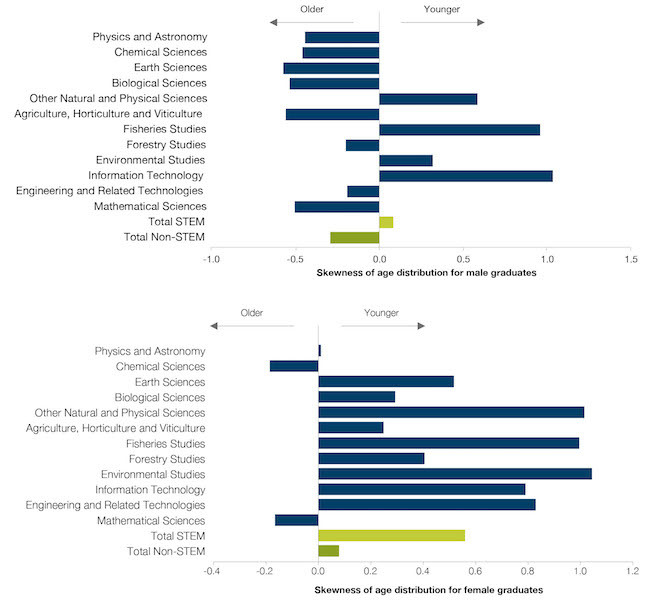 Figure 3.9 Skewness of the age distribution pattern of male and female STEM graduates, by field, Source: Office of the Chief Scientist, Australia’s STEM Workforce, March 2016, page 42’. Ageing remains a critical factor in driving the gender divide and skills deficit, with figures from the 2011 ABS showing over 30 per cent of the mathematical workforce is over 55. At the same time the mathematical sciences only accounts for four per cent of STEM postgraduates. Figure 3.6 Gender distribution of post-secondary qualifications, by field and level Source: Office of the Chief Scientist, Australia¹s STEM Workforce, March 2016, page 13. Critically Australia’s deepening mathematical skills deficit poses a significant threat to industry with sectors such as mining, telecommunications and finance heavily reliant on recent advances in mathematical research. Business investment in the mathematical sciences, however, is just 0.2 per cent of overall R&D expenditure the lowest of all STEM disciplines. “These figures represent a significant lost opportunity for Australian industry innovation. Mathematical sciences research underpins almost all other research and has far reaching impacts for industry from analysing and modelling data to forecasting and systems management,” Professor Prince said. Industry disengagement is just one of a number of symptoms indicating the worsening health of Australia’s mathematical pipeline. As the government continues its focus on delivery of the National Innovation and Science Agenda (NISA), AMSI is calling for swift and decisive action to protect future prosperity. The alignment of Australia’s mathematical sciences research infrastructure with global standards remains a central policy priority for AMSI. Most significantly, the establishment of a national research facility would strengthen opportunity for industry engagement as well as international collaboration. A move also prioritised in the Academy of Science’s ten-year plan for the discipline. “It is imperative we support research and development and global collaboration with world-class mathematical sciences infrastructure,” said Professor Prince. With time running out to reverse Australia’s mathematical decline, AMSI is calling for decisive measures to improve engagement in the classroom and foster future skill supply. Figure 1.10 Australian Year 12 mathematics students, Source: Michael Evans and Frank Barrington, Year 12 Mathematics Participation Rates in Australia 1995–2014, data collection commissioned by AMSI. AMSI’s recent mathematics education figures paint a worrying picture, with many students opting out of the subject beyond the basics. The institute’s recent Year 12 mathematics participation figures showed continued decline in the proportion of students choosing advanced and intermediate maths since 2006. STEM skills are essential to 75 per cent of Australia’s fastest growing employment areas. If Australia is to have an innovation future, the institute warns more needs to be done to address key issues such as out of field teachers (26 per cent of teachers are currently not fully qualified to teach mathematics) and restore university prerequisites (only 14 per cent of universities required intermediate mathematics to start a science degree in 2016). “A lack of university prerequisites continues to send a strong message to our classrooms that maths is not valued. As a result students are entering university ill equipped for tertiary STEM studies at a time when Australia’s future depends on a steady supply of these skills,“ said Professor Prince.